On September 15th, over 70 houses exploded in Lawrence, Andover and North Andover due to a gas line issue, displacing thousands of residents and their families. 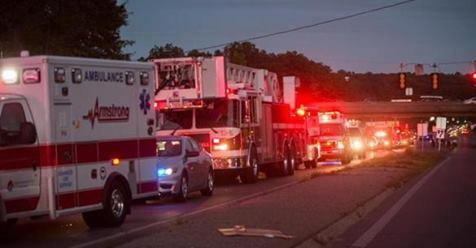 In order to support the massive EMS mutual aid MCI response, Armstrong, along with many other agencies, sent multiple units and first responders to help transport injured residents. 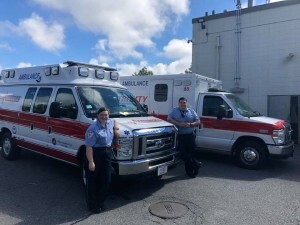 In the days following the explosions and fires Armstrong provide extra coverage in Lawrence to our partners at Trinity, allowing our greater EMS community to send more resources to all those affected. Armstrong also assisted in non-emergent work, helping transport evacuated and displaced residents to local shelters. Thank you to the countless first responders (Police, Fire and EMS) for your diligent work and tremendous efforts to clear the fires and provide relief to all those affected in the Merrimack Valley. Pictured are Armstrong Ambulance crew members, Jennifer Lynch and Brandon Whitney providing coverage to our partners at Trinity.